The Story Mansion is set to undergo an extreme makeover, one which will restore the proud structure and reconnect it to its nearly 100 year roots. The huge restoration project is set to begin this fall. The aging exterior wood will be replaced, new gutters and downspouts installed, and a fresh coat of historically accurate paint will revitalize the building and prevent further deterioration. The City of Bozeman has received $1 million in federal appropriations to finance the project—part of an ongoing commitment to carry out the estimated $4 to $5 million restoration, made possible by the efforts of countless people including Montana’s Senators Conrad Burns and Max Baucus. “The outside of the building is going to sing once again and you’ll be able to feel the history of what this place is about,” says Ben Lloyd of Comma Q Architecture, the project architect. After this first phase, restoration goes internal and will include foundation work, electrical overhaul, improved accessibility, and fire and safety issues. Completing those phases of work could take a couple of years. 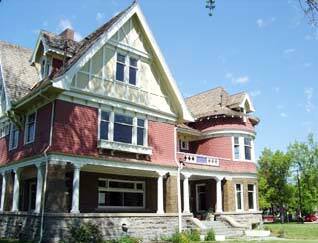 If you would like to learn more about the Story Mansion or the projects of the Historic Preservation Advisory Board – visit https://www.bozeman.net/government/community-development/historic-preservation.